Jeffrey Yoskowitz, co-author of The Gefilte Manifesto: New Recipes for Old World Jewish Foods and a chef-entrepreneur at the intersection of food, culture and business, gave an engaging workshop/demonstration for Section members, and family, friends, and neighbors of our Section members, titled “Ashkenazi Mixology: Jewish-Inspired Cocktails & Noshes.”. The event, a fund-raiser, was held at 7:30 p.m., on Saturday, Jan. 5, at a private home in Morristown. Snow date was Saturday, Jan. 12, at another private home in Morristown. Spouses, significant others, family members, and friends were all welcome and encouraged to attend. 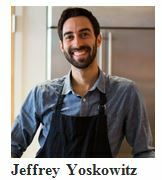 Through his work as co-owner of The Gefilteria, a culinary venture that reimagines Eastern European Jewish cuisine, Jeffrey manufactures the world’s first artisanal gefilte fish available nationally, and develops culinary programs with partners around the world. He also teaches about the history and culture of Jewish food through classes, cooking workshops, lectures, and food demos. He has cooked as a guest chef at the esteemed James Beard House kitchen, and was named to both the Forbes 30 under 30 list in food & wine and to the Forward 50. Jeffrey writes about food, culture and politics for a number of prominent publications, from the New York Times to the Atlantic to the Forward, among others. When speaking about his presentation for our Section, Jeffrey said, “Jewish cuisine of Central and Eastern Europe may not be known for elaborate cocktails, but at the tradition’s heart is a robust culinary vernacular full of familiar flavors coming from unexpected places. We’ll delve into the Jewish relationship to drinking and play with the ingredients of the Jewish kitchen to transform them into cocktails. This is a lively hands-on workshop in which participants learn the essentials of basic mixology and then make their own drinks from The Gefilte Manifesto cookbook.” The cookbook was named a finalist for the National Jewish Book Award and a top book of the year by USA Today and Epicurious. Copies of the cookbook were available for sale at the event, with a portion of the proceeds going to our Section. The committee for this exciting event was comprised of NCJW, West Morris members Anne Gorman, Reggie Yoskowitz, Kay Salzman, Melanie Levitan, Robin Solomon and Debbie Brody. The basic cost to attend “Ashkenazi Mixology” wass $75 per person until Dec. 20, and $90 per person after Dec. 21. The cost per person for a platinum sponsorship was $154 per person, which included an autographed copy of Jeffrey’s book, The Gefilte Manifesto.